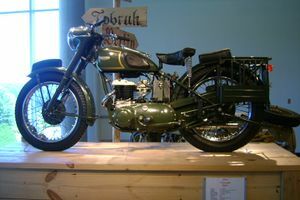 The TRW was unique in that it was only available to the armed forces, and that it was the only Triumph to feature side valve operation with the vertical twin design. The chassis was an adaptation of the versatile TR5 on-off road model, and the mild tuned motor gave outstanding flexibility, also it was the first Triumph to feature telescopic forks. The majority of these bikes were used by the British Royal Air Force, also the Canadian Air Force. This actual machine was owned and ridden by movie star Steve McQueen. This page was last edited on 10 August 2010, at 17:27.